Who doesn’t love looking over the side effects of a medication? Well, if you’re American, you get told the side effects during your television adverts. This is still something I find hilariously shocking each and every time I’m over in your beautiful country. Who’d ever take a medication that “may cause loss of memory, sickness, diarrhoea, impotence or death”. Seriously? You’d still take that?! Over here in the UK we find all that out via a little slip of paper that’s in the drug’s box. If you’re a hypochondriac you then give yourself all of the ill effects! Well, except the “death” risk. Not many people can fake death. Except David Blaine. So what about Side Effects, the latest film from Steven Soderbergh? Is its sole side effect euphoria, or is it one of those that’s going to incurably blind you… and give you diarrhoea? 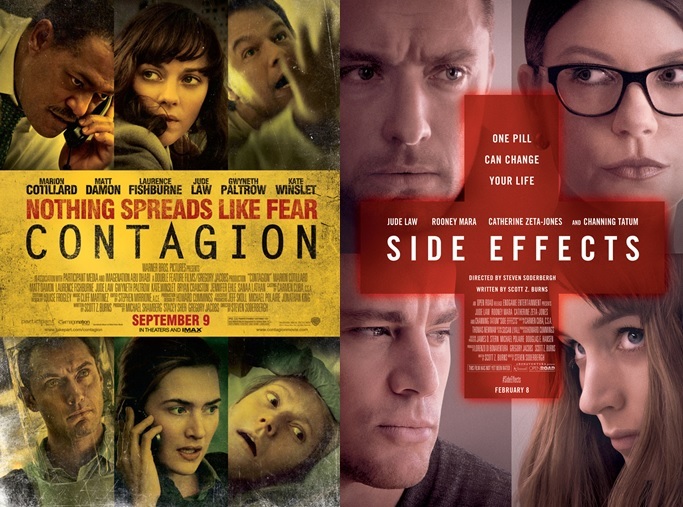 Contagion and Side Effects… effectively sister films! Now, those that know The Phage personally (beyond my alias) will know how intimately I know the film Contagion. I use it as a reference point a lot in my professional life. And to those that don’t know me in that capacity? Well, I’m The Phage… and you know what that means if you’ve read our “Introduction” section on the left over there. 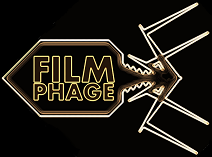 A Phage has a natural affinity for any film about viruses, plagues and biology. So when a new film comes over the horizon in much the same mould as Contagion, The Phage pays attention. Especially when the posters look near identical and it’s from Steven Soderbergh again. Briefly, Side Effects follows the story of Emily (Rooney Mara), whose husband Martin (Channing Tatum) has recently been released from prison. But Emily’s life isn’t all cheer and happiness… she’s quite depressed, manically so, in fact. After a failed suicide attempt, Dr. Jonathon Blake (Jude Law) – a psychiatrist – enters into her life to try and help her out and return her happiness. His innocent attempts to help her leads him to prescribing her a new drug called Ablixa, on the advice of her previous psychiatrist (Catherine Zeta-Jones). But that leads to all manner of crazy occurrences… but is everything that happens down to the drug, or something entirely more sinister? Side Effects is an out-and-out thriller. And a damn good one at that. If you read my review of Broken City, you’ll note that the biggest flaw we saw was how “analogue” the plot was; you could see where the film was heading within the first 20 minutes. You certainly can’t say the same of Side Effects. What you have here is an extremely effective thriller with an exquisitely outrageous twist in its tail. You won’t see it coming – I can guarantee that. Maybe though that’s also the flaw in the film because it seems so outlandish! Not in the same way that Indiana Jones: Kingdom of The Crystal Skull was ruined by aliens, but it’s still a little “out of nowhere”. One of the things I quite enjoyed about Contagion was that massive ensemble cast that was put together. Whilst Side Effects doesn’t quite replicate the large cast, it still features some superb displays of acting. 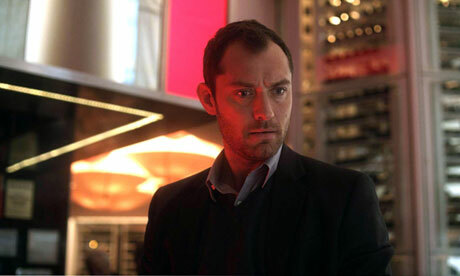 Firstly, we’ve got to talk about the return of Jude Law, who was actually in Contagion. Thankfully, he’s abandoned his quasi-Australian accent here in favour of his natural British accent. Law puts in a great turn here as the plagued psychiatrist Dr. Blake. Similarly, you’ve got to again recognise Rooney Mara for another brilliant role portrayal. She really drew my attention in The Girl With The Dragon Tattoo and this really showcases her talents yet again. Please, give her more roles. And can I just mention how beautiful she looks here? Oh, I already did? Good. However, I must say I was less convinced by Catherine Zeta-Jones; mainly because of those glasses she wears throughout. They just don’t suit her. I also can’t imagine her as a psychiatrist if I’m honest. Her performance just came across quite stale and added little to the film. But her minor misgivings can be overlooked owing to the fantastic overarching plot here. As I said earlier, I dabble in this general field outside of my film life, so I found the content enthralling; just as I did with Contagion. But I’d say that Side Effects is done far better than its spiritual predecessor, as its a lot more coherently put together with far fewer interweaving narratives. Not every film needs a Crash style overcross and I’m glad that Side Effects recognises that. Overall, it’s more straight forward than Soderbergh‘s last effort, but that makes for a far more honed and effective machine that deserves to be viewed. Side Effects is 2013’s first example of a solid thriller that’ll keep you enraptured from beginning to end. It boasts a cast that (largely) lives up to your expectations and a plot that keeps you guessing where it’ll turn to next. It’s only real drawback is that the end feels somewhat “cheap” and from out of nowhere. The film tries to show you that it’s been hinting at this all along, but ultimately, it wasn’t hinting at this at all. Regardless, Side Effects demands to be seen if you’re a fan of the genre. So it looks like the only side effects of Side Effects are a slight chance of confusion that will pass with time. Nothing too serious! It’s not like those god awful US infomertials (I love that crazy word… something else we don’t have in the UK… like Vanilla Coke, which I miss). There’s nothing to be particularly scared of with this medication. Just swallow it down and enjoy the ride!